For years I have been a huge fan of home movies. I've researched and collected them for years and have become well versed in the many forms a home movie might take: the “Up and Down the Christmas Tree Movie”, the “Panning Wildly over Scenery Movie”, the “Standing Still Even Though It's A Movie Movie”, and the like. Home films are great for family nostalgia, but amateur movie gear also empowered backyard movie moguls. Though the years many amateurs have tried their hand at remakes and re-imaginings of the adventures of their favorite sci-fi and fantasy characters. 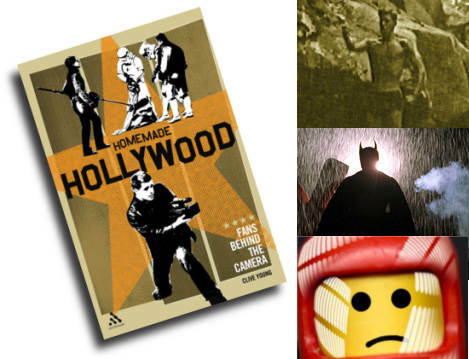 Homemade Hollywood is a new book by Clive Young chronicles the fan film from its earliest days. The author traced the first fan film to 1922 - astonishing! 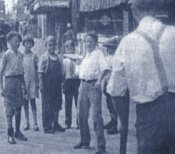 It's a great story of a pair of barnstorming scheisters that hoodwink the folks of a South Carolina town into paying the ersatz filmmakers to shooting an Our Gang comedy in their city. They did actually create the film and have a screening before skipping town, and fortunately a few reels of footage from the movie still exists today. With the introduction of Super 8 & home video decades later, even more amateurs tried their hand at creating a fan film. In 1992 Dan Poole heard the rumblings of a James Cameron helmed film starring Spider-Man. Poole beat Spidey to the screen by a decade with “The Green Goblin's Last Stand” (it's even based on the same issue of the comic that inspired the eventual 2002 movie). This flick is a must-see as they filmed a foolish spectacular stunt with a costumed wall crawler swinging on a rope between buildings 35 feet up in the air – with no safety net! The book continues on into the modern era, crediting 1997's Star Wars fan film “Troops” (a parody of TV's “Cops”) and the introduction of iMovie and miniDV cameras with igniting the fan film phenomenon. Suddenly practically anyone could create movies with credible special effects, and get an audience of tens of thousands via the internet. With that came innumerable “two guys in Jedi PJ's engaged in a random lightsaber fight in the woods” films, but there have been many gems too. In the days before the internet, fan films were mostly confined to sci-fi conventions and backyard parties – so they were hard to learn about. Many filmmakers also tended to keep their unauthorized productions on the QT. The big companies that own these cherished characters tend to be skittish and litigious about fans making free with their copyrights. Some studios have been smart like Paramount, permitting the lavish “New Voyages” Star Trek fan films that have featured actors and writers from the original series. Clive Young's book does a great job putting together the unknown history of fan films, even going so far as to index dozens of them in the back. It's a relatively quick read that I hard a hard time putting down, and the many threads of the story are drawn together remarkably well. I never got to make a fan film (they frowned on that sort of thing in film school), but after reading Homemade Hollywood I wish I had. Then again it seems like any film project, no matter what the intent, is going to be a source of drama and problems – so maybe I didn't miss out on all that much! Homemade Hollywood explores the amateur desire to create more adventures with their favorite TV & movie characters. Readers can admire the can-do attitude of these amateur filmmakers, and if you poke around on the internet you can check out a lot of these movies without waiting for the next Trek convention. If some of those big studio lawyers can take a break from sending out reams of “cease & desist” letters, the book can teach them that fan films are a labor of love, and are the sincerest form of flattery.